We got together with some friends this weekend to celebrate a mate’s birthday. We split the courses between the couples and the lovely Soni and I were allocated starters. 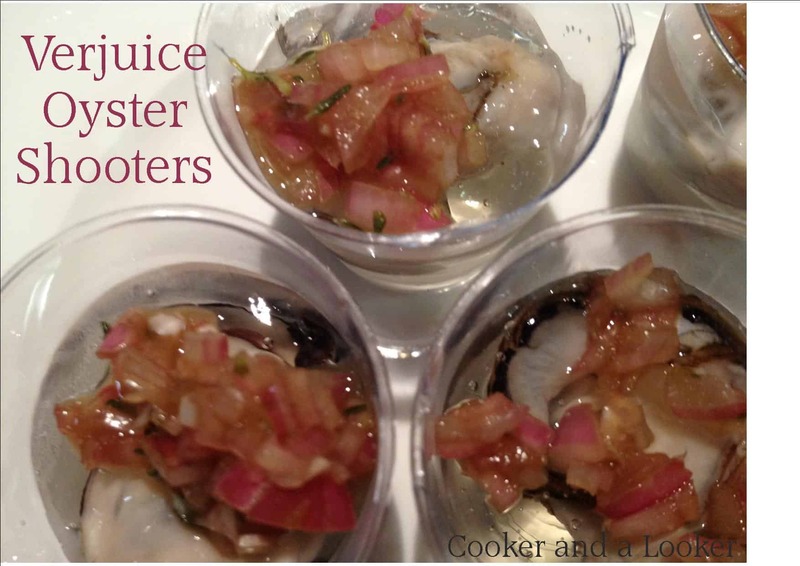 The birthday boy is fond of oysters, so I thought we’d try something a bit different – a Maggie Beer recipe for Verjuice Oyster Shooters. Not only does Maggie sell the stuff, she’s just penned a new cook book dedicated to the liquid. Needless to say I get the impression that she’s pretty fond of the stuff. It turns out her devotion is well founded! Soft the gelatine leaves in a small bowl of cold water. Heat the verjuice and caster sugar in a small saucepan until the sugar is dissolved. Remove from the heat and allow to cool slightly. Gently squeeze the gelatine leaves to remove any excess water, and add them to the luke warm verjuice. Pour a little verjuice mixture into the bottom of each shot glass and allow to set. After the mixture has set, add an oyster to each shot and top with the remaining verjuice mixture. Refrigerate until set. In the meantime, combine the sherry vinegar, shallot and thyme and allow to sit for 20 minutes. To serve, spoon a little bit of the shallot mixture on each shooter. Serve with a teaspoon by the side, so that guests are encouraged to down it in one go. * I’ve doubled the gelatine from the original recipe – Maggie says that its best if the shooters are just set, but I found that they didn’t set at all – so I whacked them back in the saucepan reheated and added another leaf of gelatine. I think we got the right consistency in the end. These were a big hit – the verjuice is a great flavour contrast and the shallots are a lovely compliment to the texture of the oyster and the jelly. Maggie’s done it again – delish!